CALDER Cannons remain in the hunt for a TAC Cup finals berth despite a 55-point loss to Eastern Ranges on Saturday at Rams Arena. The Cannons had only four less scoring shots but fell 19.8 (122) to 9.13 (67) against a Ranges side which has won its past five matches and will enter finals as one of the competition's form teams. Calder sits ninth on the ladder with two rounds to play, one game and 9.61 per cent behind eighth-placed Gippsland Power. Six teams - Geelong Falcons, Oakleigh Chargers, Dandenong Stingrays, Sandringham Dragons, Murray Bushrangers and Eastern Ranges - have locked in a top-eight finish. The remaining two spots will come down to Northern Knights, Gippsland, Calder, Western Jets and the Cannons' next opponent - Greater Western Victoria Rebels. There were positive signs in the opening half of Saturday's loss to Eastern as captain Brad Bernacki, Jack Bytel, Aidan Tilley and Mitch Podhajski played key roles to keep the Cannons within 19 points at the long break. A seven-goal third term allowed the Ranges to take control of the contest, leading by 48 points with a quarter to play. The Cannons fought hard to limit the damage in the last quarter, kicking two goals to three. 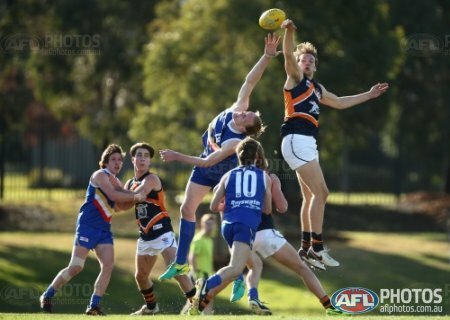 Jake Riccardi and Noah Balta, who played in St Bernard's Herald Sun Shield victory last Wednesday, were also prominent. Bernacki (26 disposals, four marks), Bytel (29 disposals, five marks , 15 tackles) and Tilley (16 disposals, two goals, seven marks) were named Calder's best players. The Cannons head to Mars Stadium - the venue which hosted Saturday's Western Bulldogs-Port Adelaide clash - this Sunday to face Greater Western Victoria Rebels. The match starts at 11.30am. Meanwhile, Cannons top-age player Jean-Luc Velissaris made his VFL debut in Coburg's victory over North Ballarat on Saturday. The Lions triumphed 16.9 (105) to 14.9 (93), claiming their second win of 2017 at Piranha Park.